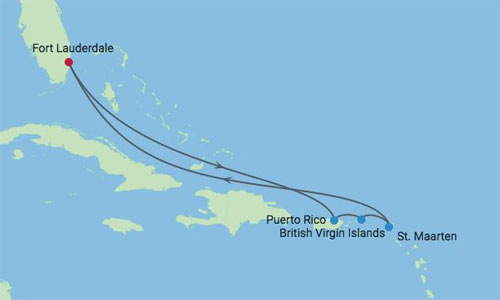 Sail roundtrip from Fort Lauderdale to some of the best destinations across the Eastern Caribbean. Make port in San Juan, Puerto Rico; Tortola, British Virgin Islands; and Philipsburg, St. Maarten. Millions of visitors choose the Caribbean for its white sandy beaches, warm waters, and lush green tropical environments that make for perfect swimming, snorkeling, golfing, and more. Puerto Rico is an island offering so many vacation experiences that it calls itself "The Continent of Puerto Rico." Become captivated by the enchantment of the island's culture, its modern city amenities and entertainment, and the tropical beauty of a Caribbean destination. Puerto Rico is the largest and most populated island of an archipelago with fertile coasts and a rugged, fairly mountainous interior with lush rainforest. Discover the historic treasures of majestic Old San Juan, the charming walled city with its imposing fortresses and colorful colonial architecture. Check out 'Plaza del Mercado' and 'La Placita', as it’s affectionately known, a thriving public market by day where vendors hawk their wares and some of the freshest produce from all over the island. And don’t forget to take some Puerto Rican rum and coffee home with you. Wednesday, February 12 - Tortola, B.V.I. Tortola is the largest of the British Virgin Islands in the Caribbean. It features several white-sand beaches, including Cane Garden Bay and Smuggler’s Cove. Road Town, the capital of the British Virgin Islands, has a harbor dotted with sailing boats and is known as a yachting hub. Road Town is home to the beautiful J.R. O’Neal Botanic Gardens which features close to three acres of indigenous and exotic plants, trees and herbs. The capital is also brimming with restaurants, shops, and is the site for the hospital, government administration offices and official Governor’s House with its historical museum. In the island's southwest, forested Sage Mountain National Park offers trails and sweeping views over neighboring cays. 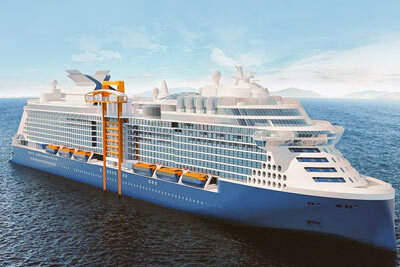 Celebrity EdgeSM marks a turning point in approach to ship design. From the incredible new Magic Carpet to the private plunge pools in the new 2-story Edge Villas, this ship design is the most unique at sea. The outward facing design breaks from traditional ship design in dramatic style. Ffeel more connected with the sea and the places you’ll visit while relaxing in a variety of spaces ranging from the Edge Staterooms with Infinite VerandasSM, to the re-imagined, terraced pool deck that offers even greater views of the destinations and shimmer of the ocean. Rooftop Garden: The Rooftop Garden is full of unexpected pleasures day and night. Find a cozy chair, sink in, and get lost in a good book. Sip a refreshing cocktail as you gaze out over the open ocean. Satisfy your cravings with gourmet burgers, brisket, and BBQ at the Rooftop Garden Grill. Drift away to the rhythm of live musical performances coming down to you from treetop sculptures. Get caught up in a friendly game of giant chess with fellow vacationers. Pool Deck: Designed by Tom Wright, the Celebrity Edge main pool and surrounding areas showcase the terraced Pool Deck—a stunning asymmetrical space that makes ocean views and landscapes the focal point. At the center of this space is a 25-yard lap pool, the largest in our fleet, featuring in-pool loungers. 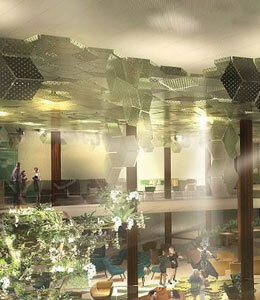 Positioned magnificently above the Pool Bar is an oversized and ever-changing mirror installation. Along with unique tree sculptures that add an air of whimsy, it’s part of a remarkable poolside gallery that sets this space apart from any other at sea. Another attention-grabbing addition to the pool deck—and another first for Celebrity—are two striking, two-story martini hot tubs, that take unwinding at sea to new heights. Private Cabanas: Just off the pool deck are the outward-facing, private cabanas. Spacious (165 square feet) and airy (more than 18 feet high), these luxurious coves invite you to climb in and get lost in the plush seating and incredible views of the sea. At night, ambient lighting turns the cabanas into intimate spaces perfect for enjoying cocktails and the moonlight glimmering off the ocean. 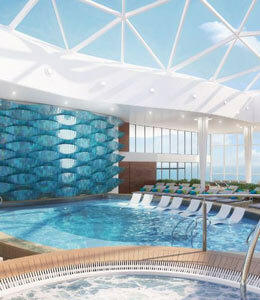 The Solarium: The Solarium now features a three-dimensional art wall that represents the beautiful colors and movement of the ocean. It’s the perfect complement to the serene atmosphere where you can restore both your tan and your sanity. A Taste of Film: Catch a movie at A Taste of Film for an interactive fusion of food and film. Dance the night away as a live band plays your favorite songs. Or just lie back on a comfy lounger and gaze up at the sea of stars above you as you glide over the sea below. The Magic Carpet: The Magic Carpet is designed with comfortable seating, a full bar, and space for live music performances. Depending on the positioning, its mood and function changes—providing exciting new venues, incredible visual perspectives, and a distinct experience on every deck it visits. At the very top of the ship, the Magic Carpet becomes an extraordinary venue high in the sky where mouthwatering experiences such as Dinner on the Edge are hosted. Down to Deck 14, the Magic Carpet becomes a stunning extension of the main pool area, while on Deck 5, it serves as an unforgettable, open-air dining experience. Then at the bottom on Deck 2, the Magic Carpet becomes an extension of modern luxury at The Destination Gateway. 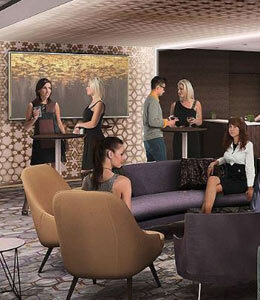 Eden: Eden, like so many aspects of Celebrity Edge, represents another revolution in modern luxury travel. It’s a space where nature is so present, it is “a room that lives.” It’s an experience so multi-faceted and innovative, you won’t find anything else like it at sea. No two visits to Eden are ever the same. Spacious staterooms located throughout the ship, each with its own private veranda. 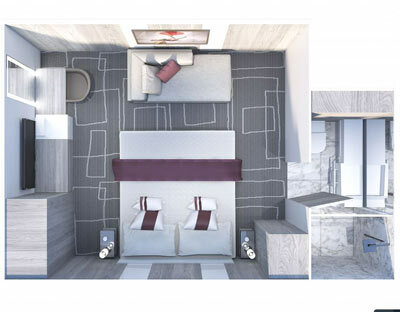 Staterooms with ample living space, including a flat screen TV. $100 December 11, 2019 to January 10, 2020. No refund after January 10, 2020; however, 50% of tuition paid may be applied toward tuition for another Northwest Anesthesia Seminars program within the next 12 months. Cancellation must be in writing.